Cereal Leaf Beetle (Oulema melanopus) is a pest in small grains. It is established in the northern US. Its damage causes yield loss and its presence can affect the sale of those commodities. It has been found in fifteen counties in Wyoming. 2,147 total survey observations have been made in 22 counties. 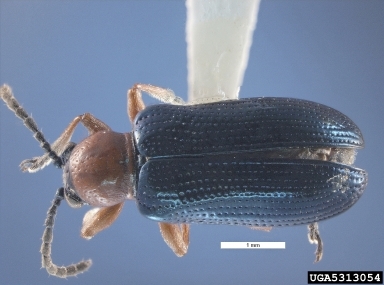 The Cereal Leaf Beetle Survey has been conducted through a joint effort between USDA APHIS PPQ, the University of Wyoming (UW), and the Wyoming Pest Detection / CAPS Program. Surveys are conducted visually in the field. A sweep net is used to locate adults and larvae; the eggs are small and require close inspection of the host material. The initial observation of Cereal Leaf Beetle was made in 1987 by UW.